It is time for one of my favorite readathons! I didn’t plan to do it this year because I have a photo session for a large part of the day but I decided last minute I would just participate as much as I could. The Dewey’s 24 Hour Readathon runs for 24 hours and you try to stay awake for 24 hours and read as much as you can. In my time zone it will run from 8 am Saturday morning to 8 am Sunday morning. My stack this year is much smaller than usual! 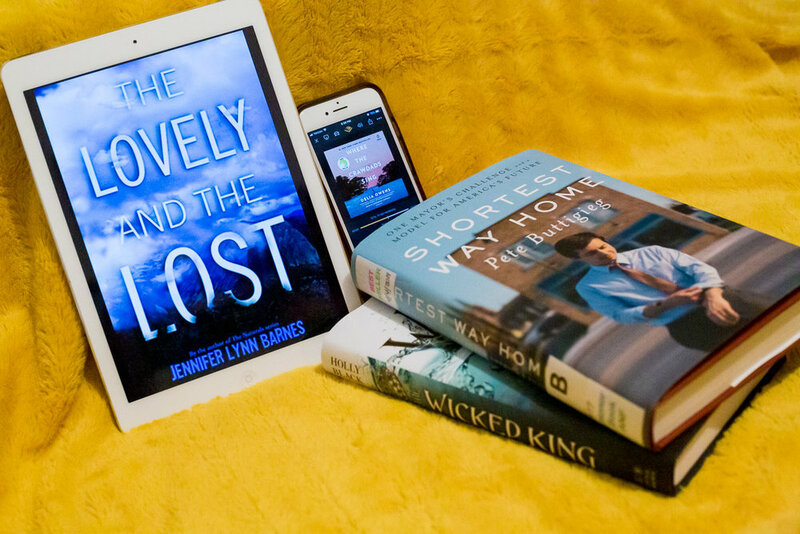 I plan to finish an ARC I am reading, The Lovely and the Lost by Jennifer Lynn Barnes. I want to finally read The Cruel Prince by Holly Black and maybe get started on the sequel, Wicked King. I also will be listening to Where the Crawdads Sing on Audible and I hope to get started on Shortest Way Home by Pete Buttigieg. I am looking forward to this readathon. Let me know in the comments what you will be reading! I will be updating on Litsy, Goodreads and Twitter. Well it’s been a busy day. I didn’t sleep enough last night so I am afraid I will not be able to stay up all night. But we shall see. I woke up right before eight and started reading. I was already 50% done with The Lovely and the Lost. This book was very good! I definitely recommend it especially if you love Jennifer Lynn Barnes. Also, if you haven’t checked out her The Naturals series do so. It’s a great YA series. I then started reading Shortest Way Home by Mayor Pete. I like the writing style of this so far. It’s very interesting to read about the start of his life and I am looking forward to finding out more about him especially when I found out he was born the same year as me. It made me pause and question my accomplishments :-) I had delicious leftover Pad Thai for lunch and that was it for the food I have in the house. Which of course is totally against everything the Readathon stands for. I had to go to my photo session after lunch. I listened to my audiobook, Where the Crawdads Sing on the way there. Three hours later I headed to the grocery store to get my snacks. I might have overdone it a bit considering it was 4 pm. I don’t think I will have time to eat all this! I am finally settling in for an evening of reading so I will check in later. Although the series finale of Crazy Ex Girlfriend is calling my name especially since I am enjoying some delicious pretzels. So afraid that I will see spoilers that I haven’t been checking Instagram or Twitter. Well still awake but I am getting pretty sleepy so I might have to nap soon. I haven’t been able to finish another book. I have just been switching between my audiobook and Mayor Pete’s book. I did start The Cruel Prince by Holly Black. I have been looking forward to this one. I am liking it so far! I have eaten way too many snacks tonight. And I can’t believe the Cherry Coke I drank at dinner isn’t keeping me awake. I started flagging a little before one but then bad storms started and my dog is terrified of storms so I had to go downstairs and keep him company. Well this wants my most successful Readathon but pretty good for deciding to do it the night before. I am determined not to schedule a photo session during the October Readathon. I was really excited to hear about the A Century of Books challenge on The Readers podcast. What an interesting idea. Basically you read 100 books one for each year. This is right up my alley. I figure it will take me a few years to complete the challenge but I am excited to do this. It will give me a chance to read books from different eras. I have decided to do the 100 books starting in 1915. I looked on Goodreads and wow there are so many good books from that year. I am excited to get started. 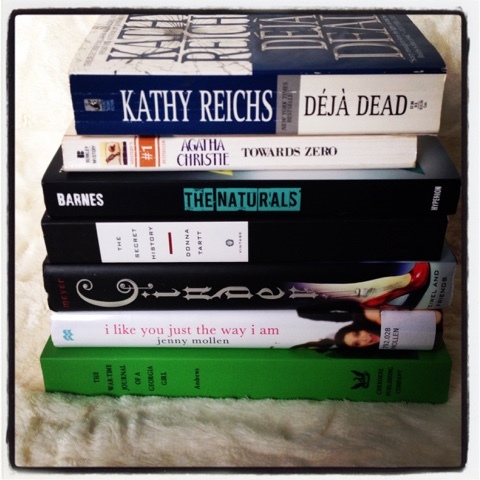 I am just going to keep track of the books I read in this blog entry. I may every once in a while do a separate blog entry to update on books read or do some book reviews on the books I have read. Let me know in the comments what your favorite book is from each decade!
. Thankfully Reading is November 27-30 and is a way to stay at home and relax while shopping and Black Friday nonsense is going on. There are no rules just to read whenever you get time. I love this challenge and really enjoy my time Thankfully Reading and blogging about it. This is usually the only time I ever consistently blog! I have been setting aside some books as they come in specifically to read that weekend. This is what I have set aside. I will probably also throw an audiobook in there to read while driving and cooking.